Hello folks!!!! I have been gone for a really long time so the best way I know to come back is to show you products I have used up. My goal this summer was to use up all the half empty items I have in my stash. I wanted to get through a lot of stuff cause there’s no point in having tons of half used products crammed in drawers. and rankly it’s just a waste of money. Also it helps me to not buy more of the same things. So I put mot of the products in categories because I use a lot of the same things just different brands. Now warning: I have a ton of goodies so lets get started. I enjoyed all of these cleansers. The equate daily cleanser is compared to clearasil daily cleanser and it is one of my favorite cleansers. the Olay facial wipes are perfect for travel. 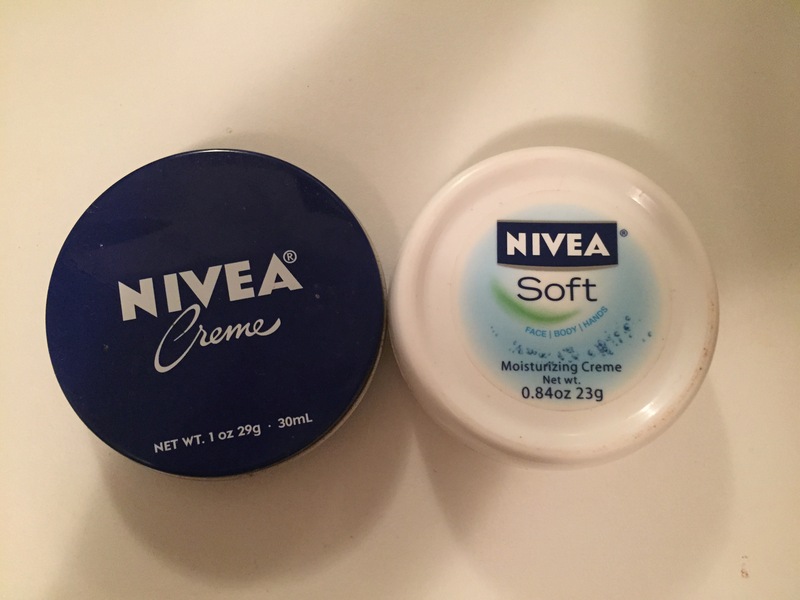 I can’t travel without them, the top box is combo/oily and the bottom box is sensitive skin. They fit perfectly in a sandwich bags and no worry about spilling. 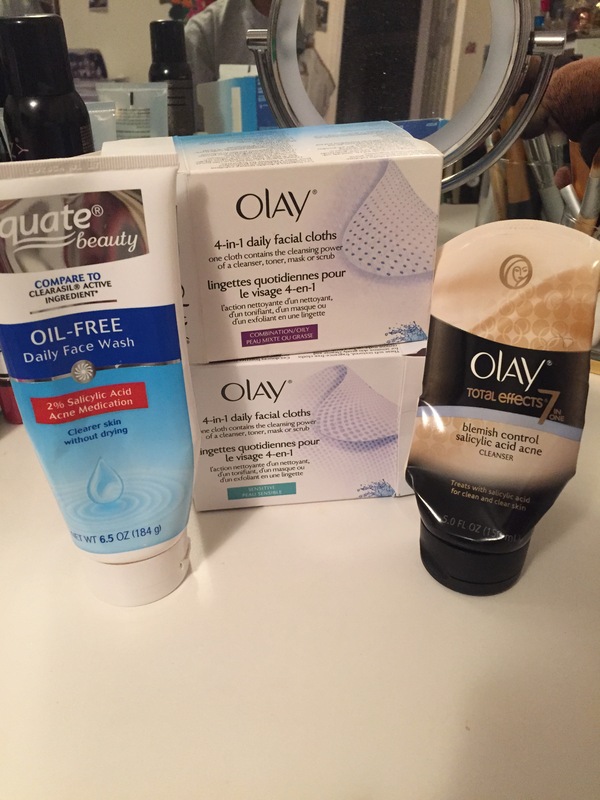 The Olay total effects has light exfoliating beads that I loved for everyday use. Not abrasive at all. Also doesn’t foam, which takes some getting use to, but your skin doesn’t feel stripped or tight after washing. I would repurchase all of these again. All of these cleansers except for the sensitive skin has salicylic acid in them which is great for blemish control. 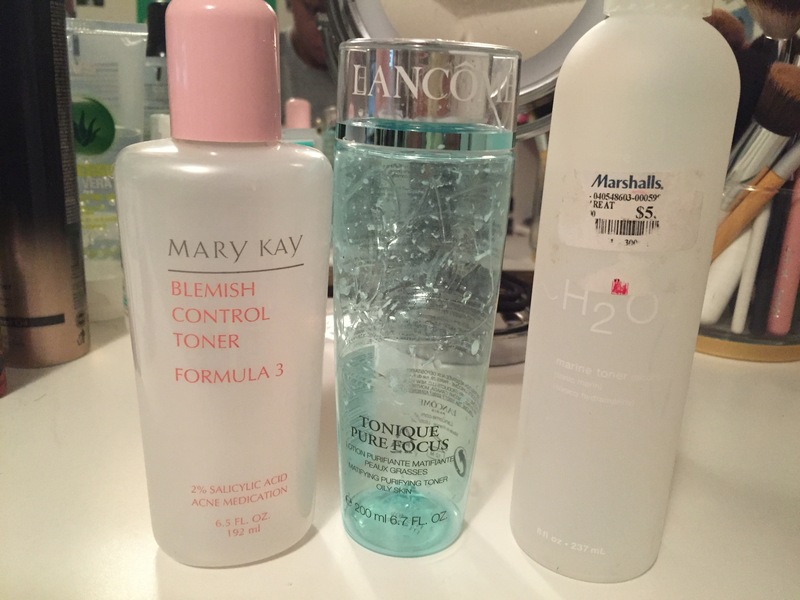 I have been repurchasing the Mary Kay toner since I was in high school, which was a long time ago. It helps clear and prevent blemishes. 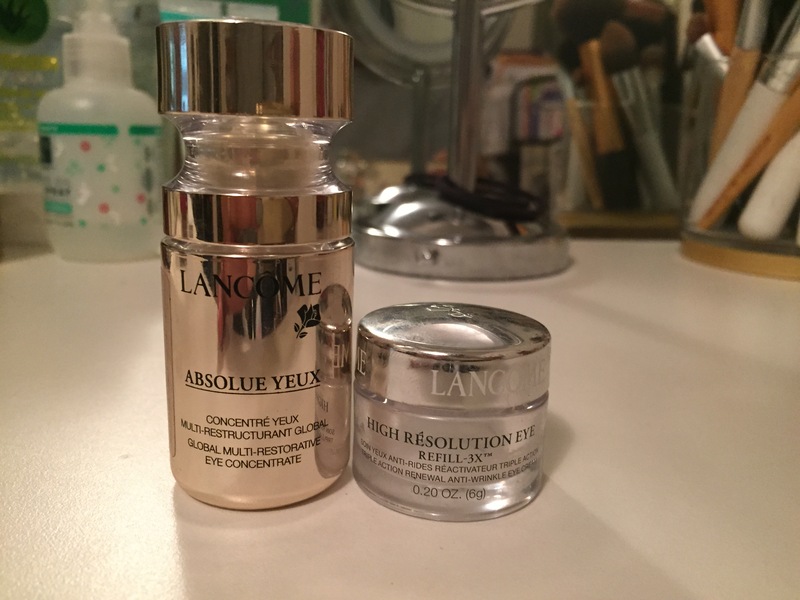 The Lancome pure focus is perfect for controlling oil. It has a mattifying power at the bottom of the bottle that helps you stay matte and keeps your oils at bay. The H2O toner was just okay. Nothing special. It has sea salt in it which helps keep pores tight. these two together are a match made in under eye heaven. Absolu yeux is an eye serum that restores the thin skin under the eye. It has no moisture, just concentrated treatment. I then add the high resolution eye cream on top which seals in the serum and leaves the under eye glowing and soft. I would love to repurchase the absolu jeux but it is very expensive. I’ll definitely be saving up for another one though. 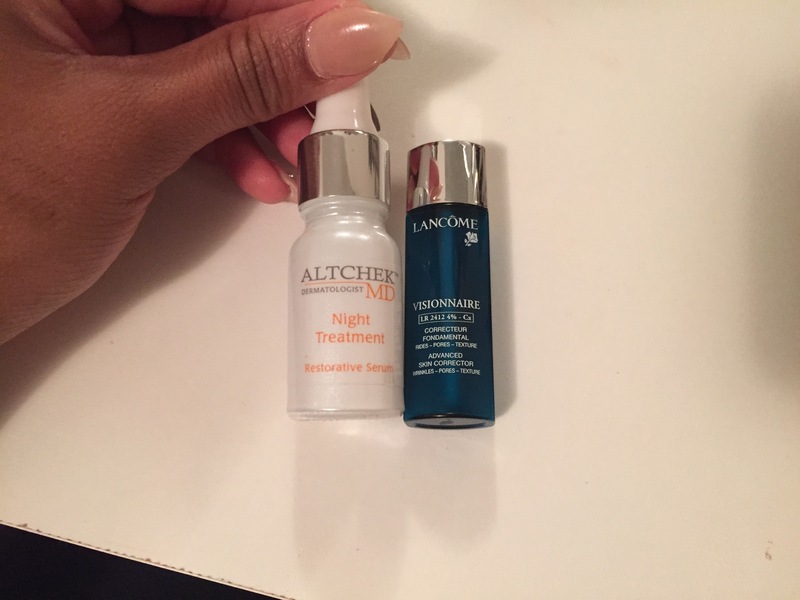 The Altchek night serum and the Lancome visionnaire claim to do the same thing, even skin tone, lighten darkspots, demise the appearance of pores. The Visionnaire really showed a difference in my skin. It has great anti aging properties in it and gives my skin a really healthy look. The Altchek serum took longer to show a less expressive difference. Not my favorite. This is my holy grail body wash!!!!! 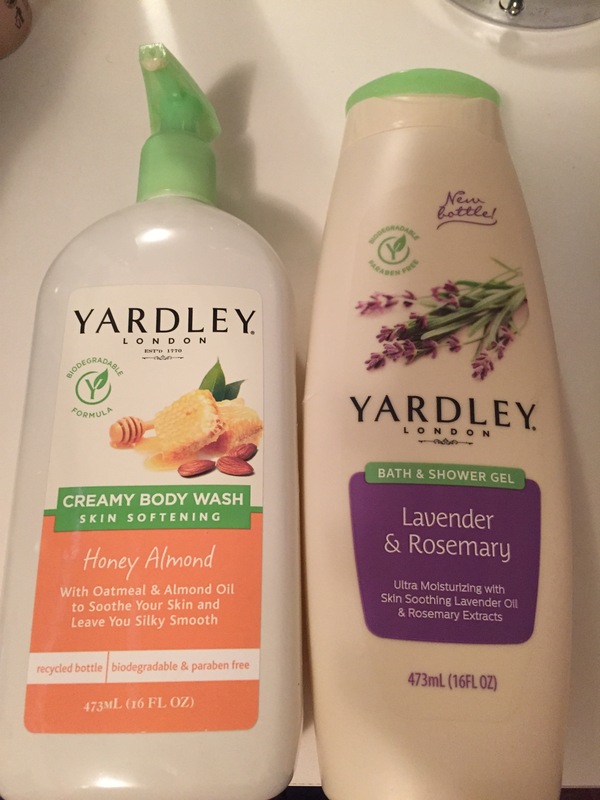 The honey almond is a cream wash and the lavender rosemary is a gel wash. I got the rosemary because the honey almond is hard to find around my way. They have other scents. My absolute favorite is mango lily but I can’t find it anywhere in my area, I did order some on riteaid.com (yup sure did). I did find the sea salt one that I want to try next. I love these to have in my purse. 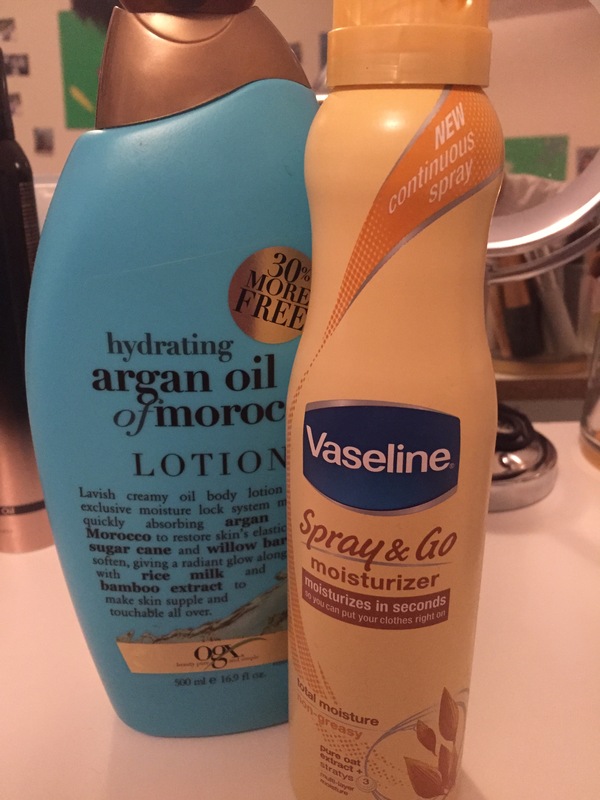 They both are great to have to moisturize throughout the day. I’ve had this foundation for ever!!! It was discontinued a few years ago but I would still find them on ebay. This is a really mice foundation. It has a whipped consistence with a powder feeling finish. I’m guessing that they were competing with the revlon color stay whipped. they should have kept this one on the shelf a little longer. 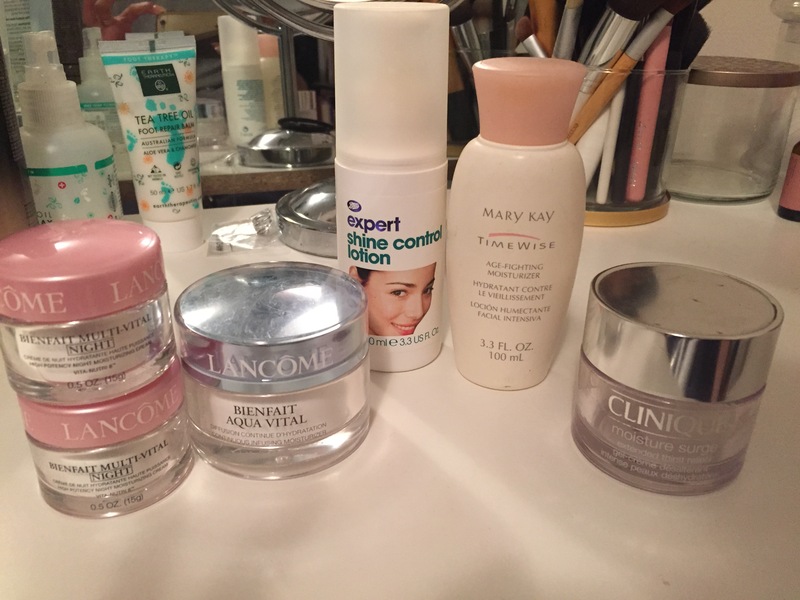 This has been in sooooo many of my posts from favorites to empties. i absolutely love this conceler for face highlighting. It’s amazing and i use it all the time. I’m working on one now and have two more in my backups. All of these mascaras are in black exept for the firs one. The FYEO, for your eyes only, is in the color royal blue. This is a really nice mascara for a pop of color on the lash. It is cruelty free. The clinique high impact is a really nice mascara that I will repurchase. I didn’t like the primer side of it. the clinique bottom lash mascara has a tiny brush which is perfect for my tiny bottom lashes and outer corner lashes and keeps the mess minimal. 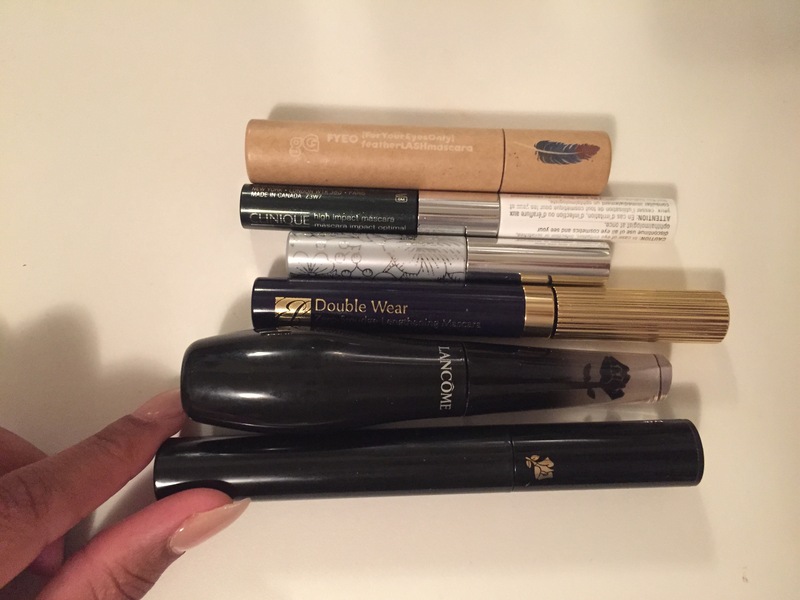 Estee Lauder double wear zero smudge mascara….. I HATED IT!!!! It made my lashes crunchy, hard, brittle, dry. And it took all the kings horses and all the kings men to get it off and I still had raccoon eyes in the morning!!!! I have never disliked a product so much. I couldn’t even finish it. Now Lancome grandiose is my holy grail mascara. They make my short straight lashes look like falsies!!! Amazing formula, doesn’t smudge and easy to remove at night. The Lancome Oscillation is another one of my holy grails. the wand vibrates allowing you to coat every lash even if you didn’t know it existed. 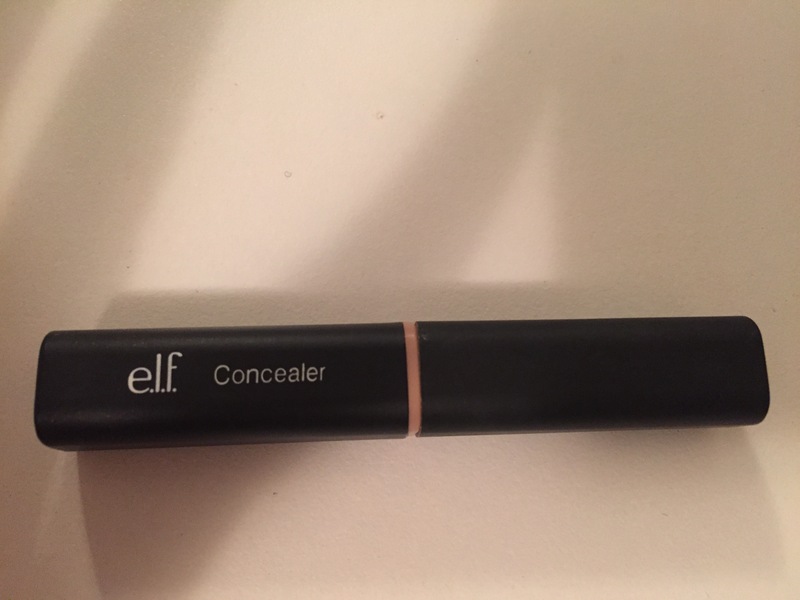 I like the elf brow gel. keeps my brow hairs in place. The Lancome brow pencil is the best I have ever used. The formula is very smooth and stays all day without fading. The It Cosmetics YBBB is an amazing pencil as well. 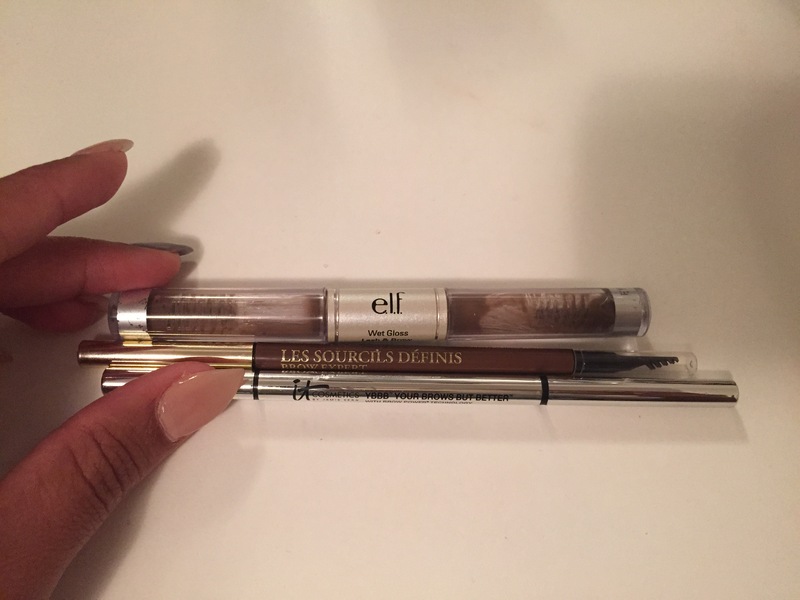 very easy to use and the taupe color matches all brow colors. 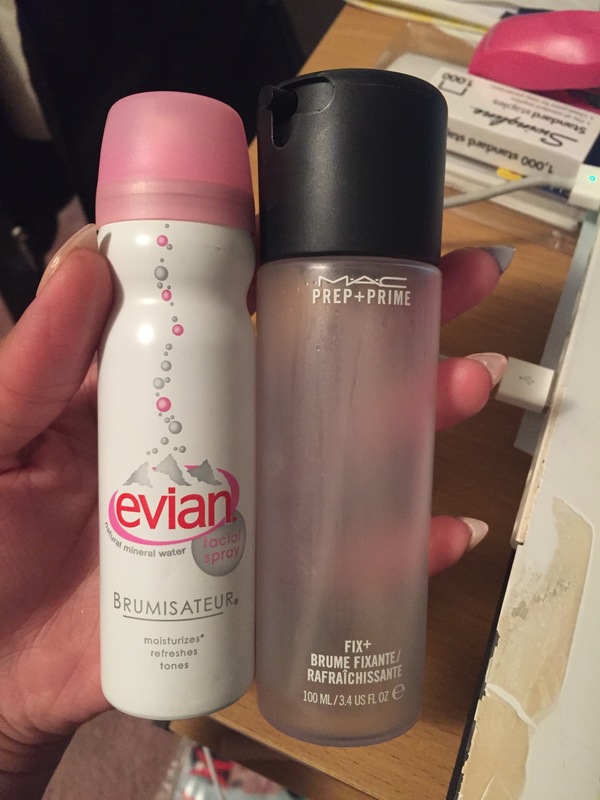 I like the evian facial spray to use before I tone my face. It takes away the tightness in the skin after washing. It’s also nice for when you are out in the sun and need a little cool down. Mac fix+ is my holy frail. It has glycerin in it which keeps makeup for looking cakey. I also love it to give my foundation a glowing finish, to foil and help my shadows and pigments pop. 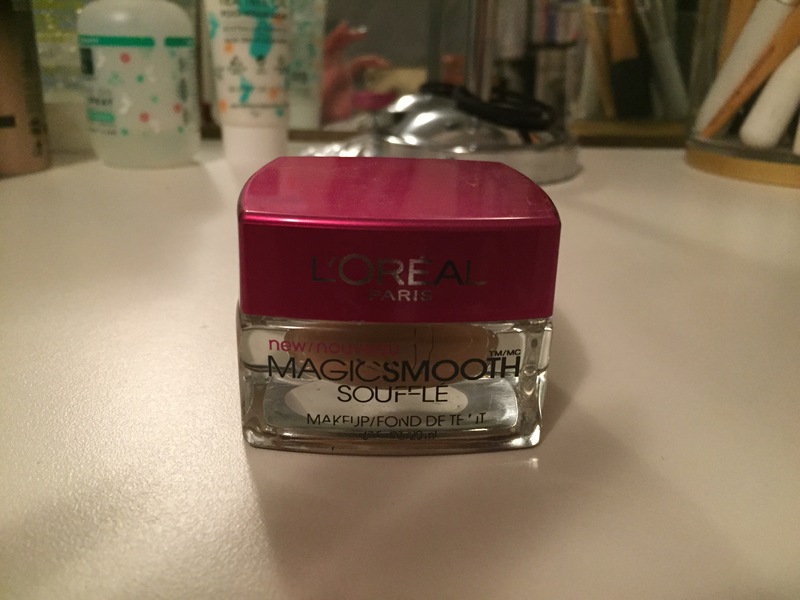 This product is multi use and I can’t live without it.